Tall buildings must resist overturning due to lateral forces from wind, earthquakes, or even their own weight. Beyond insuring against catastrophic failure, engineers and architects must design structures that do not flex too much, since movement can damage joints, cause leaks, and even break windows and fa¸ade panels. Inside, excessive movement can also jostle or jam elevators, crack walls, and cause unnerving creaks and groans. Many people are sensitive to even slight motion in buildings. Structural engineers use wind-tunnel laboratories to test their designs. 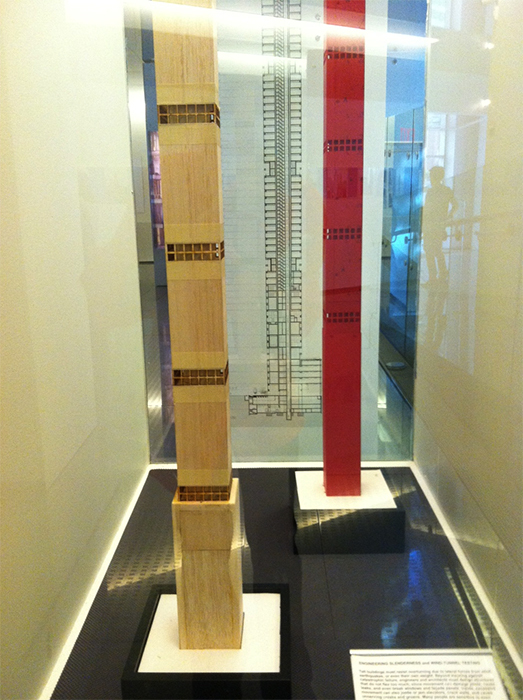 The models in this case of 432 Park Avenue were developed for the engineers WSP Cantor Seinuk (now known as WSP Group) by the consulting company RWDI, a testing lab in Guelph, Ontario. 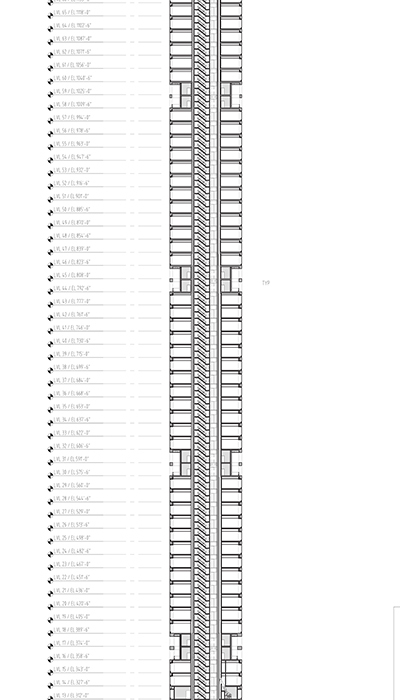 Portion of an elevation section of 432 Park Avenue. Courtesy of Rafael Vinoly Architects. The structure consists of an architecturally-exposed concrete tube system, coupled to a central core with concrete strengths of more than 14,000 psi. A flat slab spans from core to perimeter with no interior columns, giving the interior space planning the maximum flexibility possible. Given the tower's height and aspect ratio of more than 15:1, the efficiency of the structure is of the utmost importance in order to create structure that works harmoniously with the architecture. To that end, every inch of concrete is utilized to provide lateral stability and maximize efficiency. As with most high-rise buildings, controlling the perceptibility of lateral motion building in high wind conditions is a key design focus. To that end, a series of openings through the structure were developed through wind-tunnel testing that improve the aerodynamics of the building. In addition, two tuned-mass dampers were designed to further reduce lateral accelerations to acceptable levels for the occupant's comfort.